336 pages, numerous colour images. The book is magnificent and colourful – packed full of information, with a large number of excellent photographs from many contributors. 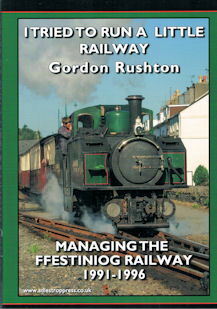 There are drawings, diagrams and maps of both Railways shown in the endpapers, so the reader can find the photo locations. Particular attention has been paid to design. 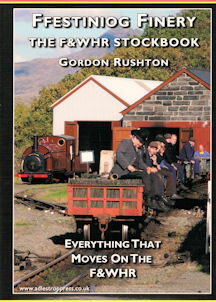 There are 14 Chapters in the book, covering locomotives: England, Hunslet, Fairlie, Garratt, ‘other’, and diesels. 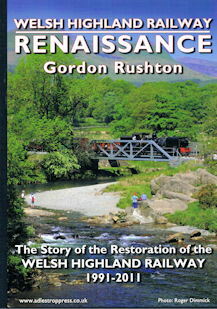 There are two chapters on Carriages: Victorian and Vintage, and Modern. Chapter 11 is on Waggons. Chapter 12 is the Stocklist proper, in the form of a table. Chapter 13 is an Appendix, with some original and valuable information in it: information of ‘why’ is addressed, and of driving Fairlies and Garratts. Norman Bond and Glenn Williams expand on carriages and painting, and this explains a lot. Some fascinating speculation on the little-known horse tramway follows, along with the official F&WHR Permitted to Run notice. The Appendix ends with some drawings, notes on SAR Diamond Frame bogies, and the yards, Minffordd, Boston Lodge and Dinas.